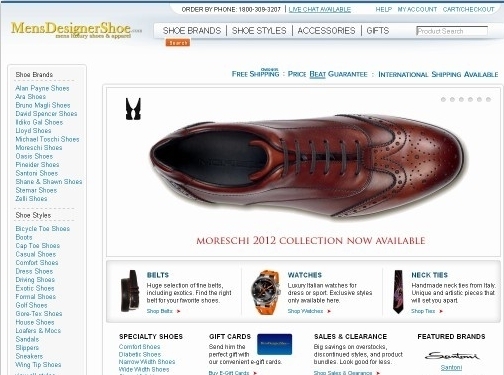 At MensDesignerShoe.com we pride ourselves on offering our customers a wide range of men"s luxury shoe brands and styles, many of which cannot be found anywhere else online, and at the best prices out there. Our shoes are imported from Italy, Germany, Turkey, and around the world. We also carry a very fine selection of men"s accessories, including watches, wallets, ties, bags, and more. Our store is organized into both brand and style categories to make shopping very easy. Find shoes for every occasion at the click of a button. Enjoy personal attention and assistance with your purchase through our Live Chat and 1800 customer service lines. Price Beat Guarantee - ensures that we will beat the price of any competitors selling the same products online. Come visit us and enjoy a unique shopping experience where your needs are catered to by people who are here to help. US based company offering men's footwear for sale. Website includes e-commerce facilities, delivery and returns information (under "Online Policies"), blog, contact form.